Galaxy S8: What is Samsung Connect feature? 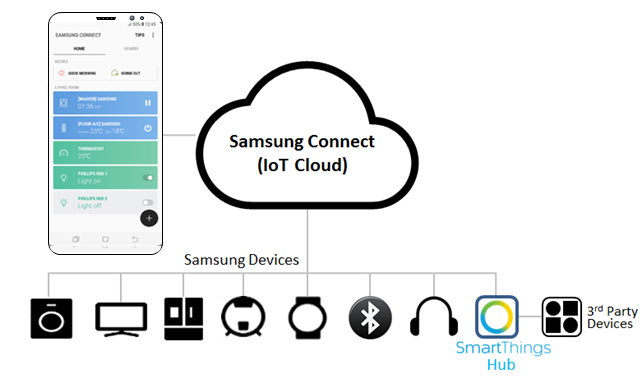 Samsung Connect allows you to quickly search for and connect to nearby devices, home appliances, TVs, or Internet of Things (IoT) products. You can easily control the connected devices and check the status of your devices at a glance on the dashboard. • Connecting with nearby devices: Quickly search for nearby devices, such as Bluetooth headsets or wearable devices, and connect with them. • Registering and controlling home appliances, TVs, and IoT products: Register smart refrigerators, washers, air conditioners, air purifiers, TVs, and Samsung SmartThings on your smartphone, and view their status or control them from your phone. You can group devices by location and set multiple devices to operate automatically at a preset time. For example, you can set the lights and your robot vacuum to turn on automatically in the evening. • Your smartphone and other devices must be connected to a Wi-Fi or mobile network. Galaxy S8: Can I use my device in sea water?